The mothership and I have a fall ritual of making Super Tonic, based on a recipe developed originally by Dr. Richard Schulze. He charges big bucks for it and sells it in a 2-oz. dropper bottle, but we like it so well for so many things that we make it by the gallon and bottle it by the quart. It takes awhile but is not complicated. 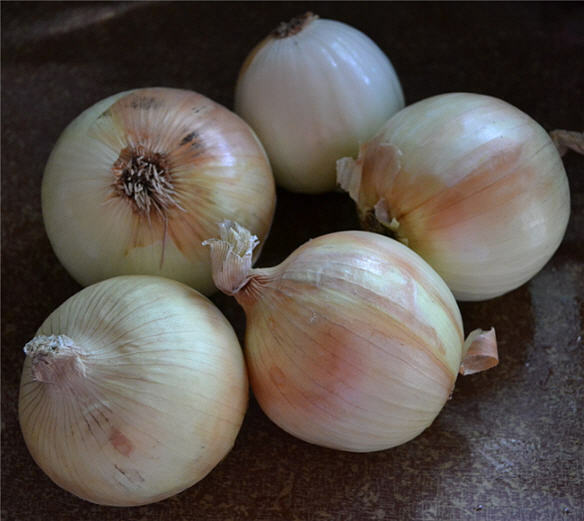 The recipe is simple: roughly equal amounts (by weight or volume) of these five ingredients: garlic, onions, ginger, horseradish, and hot peppers, plus apple cider vinegar. All should be fresh, and the mothership insists on organic, of course, but that’s up to you. Nothing about the recipe is carved in stone; “close enough” works just fine. This formula is said to help ward off colds, flu and even the plague, but it also adds a nice zip to soup and salad dressing. It’s essentially just a wonderfully flavorful vinegar that is packed full of excellent micronutrients as well. (Read more about the health benefits). First you’ll need some quart jars. They should be thoroughly washed but do not need to be processed in a water bath before or after filling. We used reusable plastic lids. 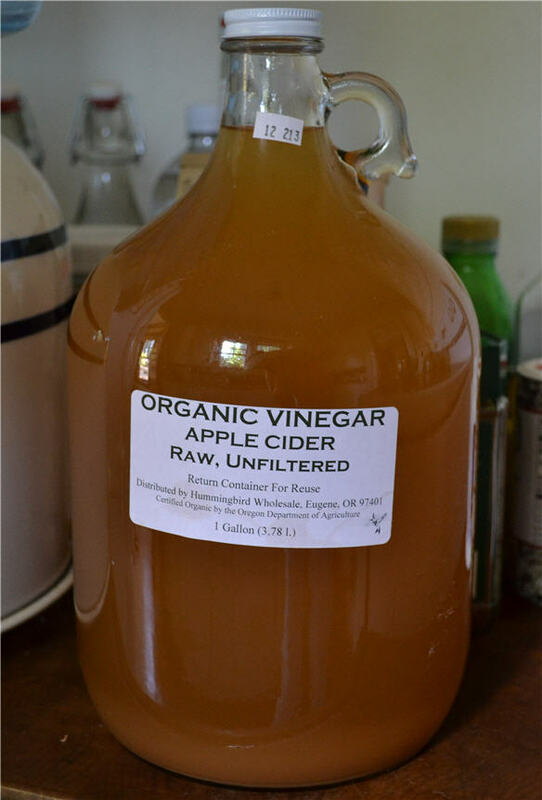 Apple Cider Vinegar: We used nearly 3 gallons altogether. Onions: These added up to only 3 pounds, which seemed like a lot for the other ingredients. 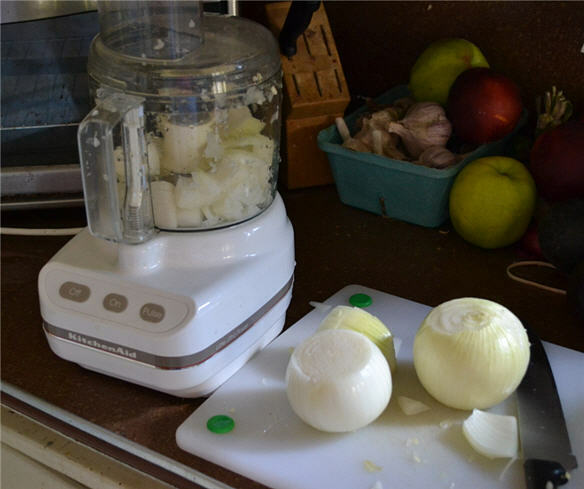 White onions are best because you want the strongest possible flavor. 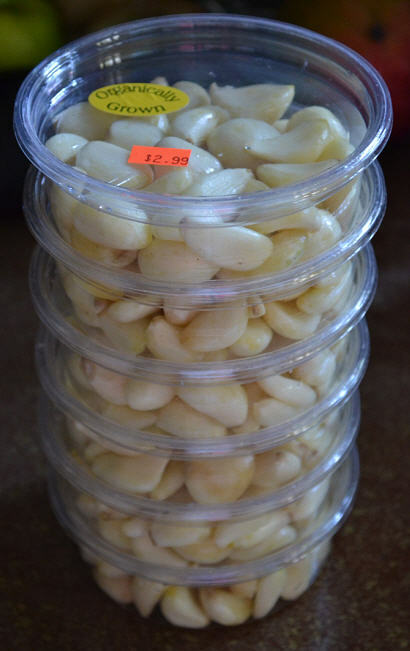 Garlic: We decided to save ourselves some labor and get the cloves already peeled. 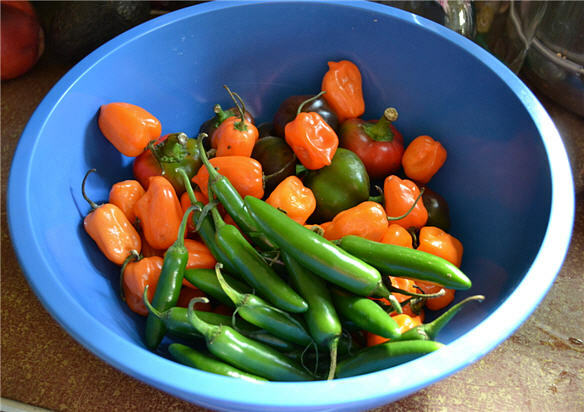 Peppers: My preference is 100% Habaneroes, but we went to three different stores and could only find about one pound of them. We added Serrano peppers and Cherry Bombs for the balance. 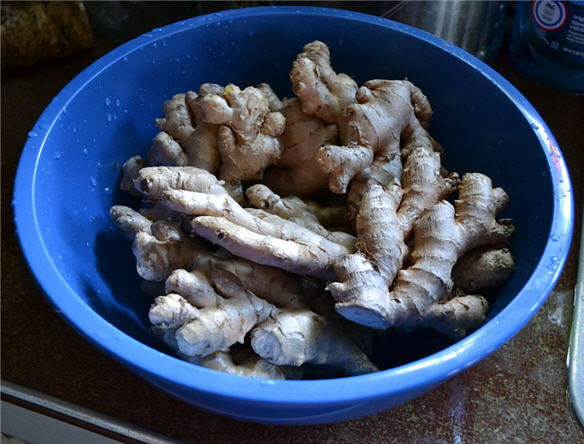 Ginger: We found plenty of this, so this year’s recipe is a bit ginger-heavy. 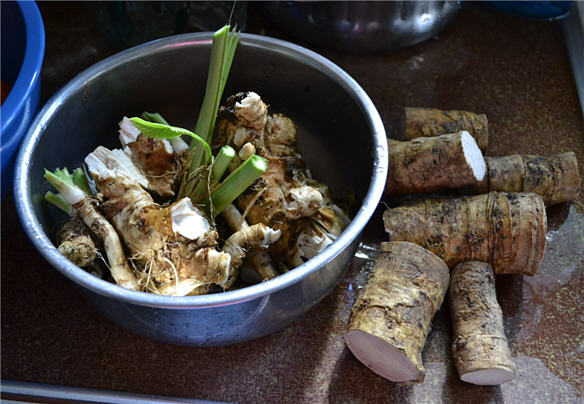 Horseradish: We harvested some from our garden (below) and purchased the rest. Produce doesn’t get any fresher than this! 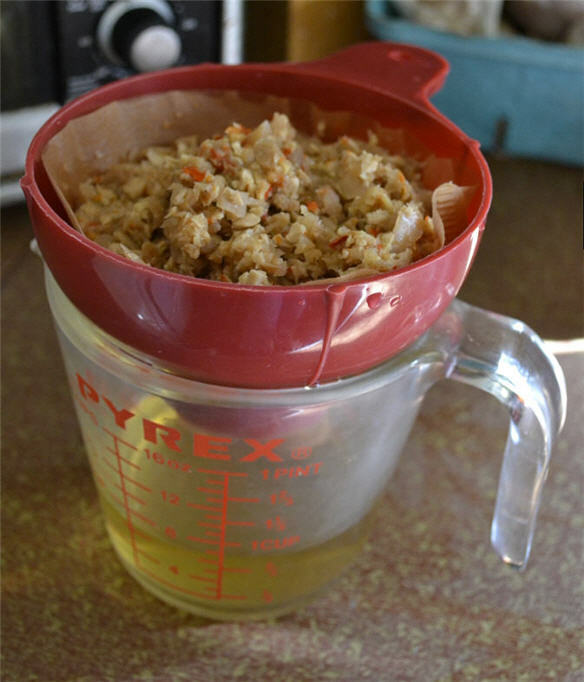 Preparation is easy: Just wash everything, cut it all up into chunks and throw it in the food processor. You want a medium chop–not too fine, not too rough. 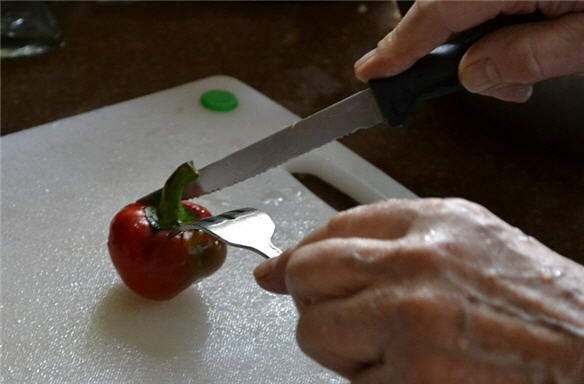 If you don’t have latex gloves, remove the stems from the peppers with a knife and fork to save yourself pain later. 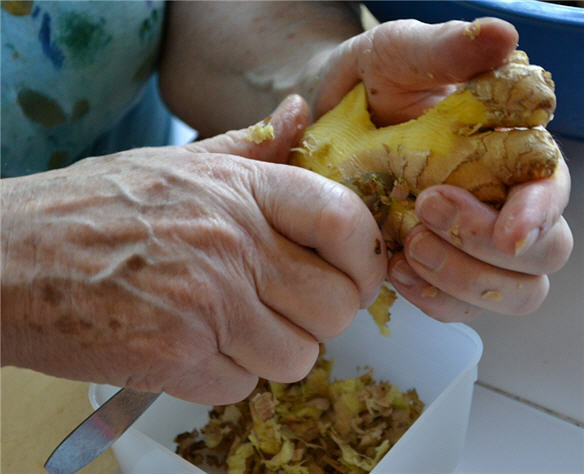 Peel the ginger with a grapefruit spoon before chopping. Sounds weird but it works really well. Peel the horseradish with a paring knife and chop it into bite-sized chunks for the food processor because it’s a hard, woody root that is not easily chopped. That’s a lot of vegetables. Resist the urge to breathe deeply right over the bowl unless you want your sinuses forcibly cleared. Now all you have to do is ladle the veggies into clean jars and fill the jars with vinegar. Mothership says to fill the jars only halfway so you get more tonic from it, while I prefer to fill them two-thirds or three-quarters for stronger flavor. 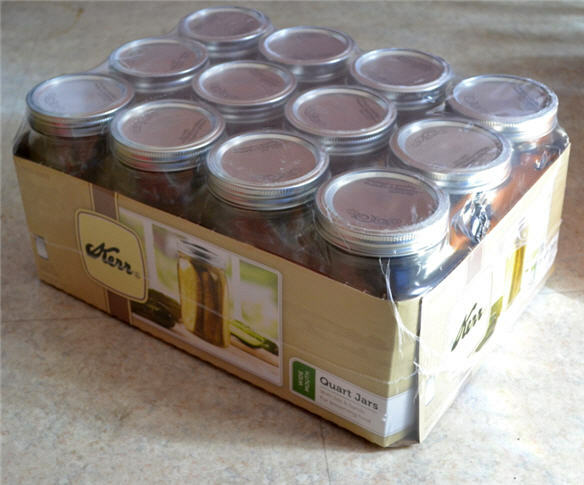 Jars don’t need to be sterilized, sealed or processed. We bottled 17 quarts at a cost of less than $100 in food and jars. The same amount of “official” product would cost nearly $6,800. Store the jars in a cool, dark place for 3 to 6 months, gently inverting them periodically (once a week should do it) to mix the solution around. How long it should be stored is strictly a matter of personal preference. When you decide your Super Tonic is ready to use, decant it into a colander (to strain the large solids) lined with cheese cloth (to strain the sediment). A funnel with a coffee filter works well for small batches. 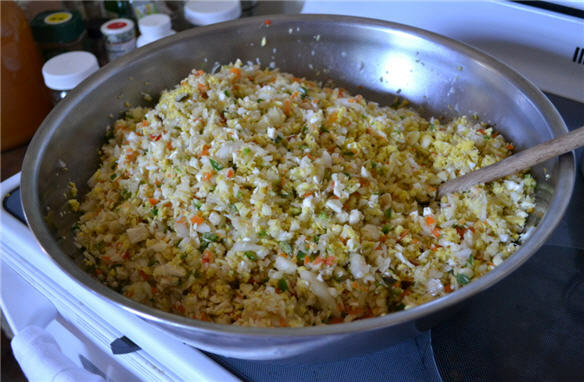 Discard the chopped vegetables promptly; you don’t want that overpowering smell in your household trash can for long. 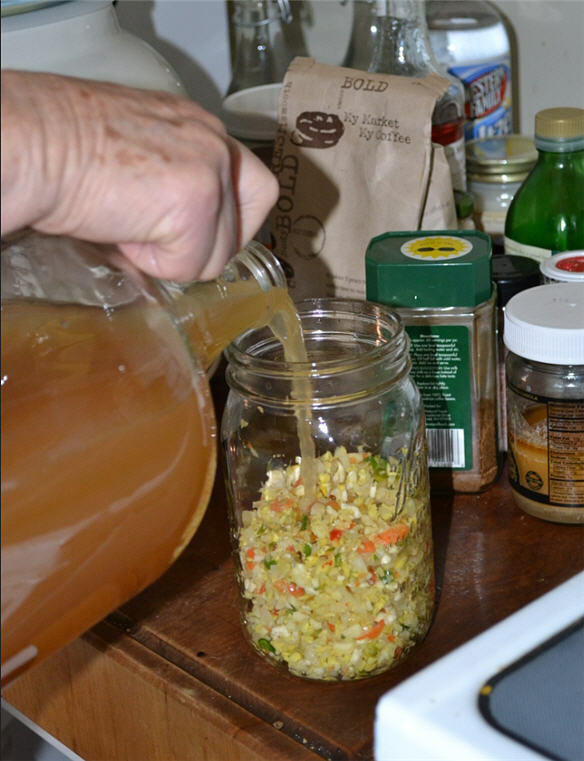 This amazing concoction keeps for many months and can be used any way you’d use regular vinegar to add wonderful flavor to all kinds of foods. Enjoy! This entry was posted in Cooking, Food, Health, Original Photos and tagged dr. schulze, recipe, super tonic by Lisa Shaw. Bookmark the permalink. I left my garlic bulbs whole, and they turned greenish blue, making the whole tonic blue. Then When I tasted it, I laughed hysterically like I was high…. What did I do wrong? Does this stuff go bad? I made some about 2 years ago and forgot about it in the garage. There is a section towards the top that appears a little darker in the bottle. Just checking to see if I need to throw it out and make more or if I should strain it and bottle it. I made a large batch for personal use in March of 2012. I’m using it at the rate of about 1 ounce daily and have had know issues with it and this is 2017/11. It is by no means a tame product for sure. This was strained at about the 2 month mark of aging. 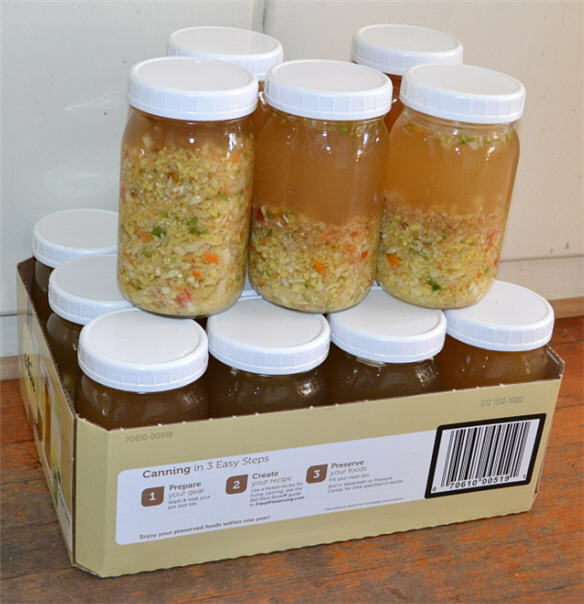 So you don’t use the fermented vegetables? Why not eat them? We made this super tonic last year and I strained the solids after a couple of months in the fridge. Since we really like horseradish and I make my own anyway, I just added this to my regular horseradish root and labeled it super radish. It is fantastic. (when making my normal horseradish I add salt as well as vinegar which preserves it, no cooking needed) My horseradish root is much finer than yours as I pulverize it in my food processor to a pretty fine consistency. When using as a meat condiment, I spoon into a small dish and mix 50/50 with sour cream. I also add just a dab to the filling for deviled eggs, gives them a tang and everyone asks what I do that’s different. This is also good on any meat sandwich. One excellent famous restaurant uses simple whipped cream with horseradish for condiment for prime rib, of course no sugars, etc. just whipped cream to cut the horseradish. The solution we make is only sitting for 6-8 weeks and is still very potent. However, we use cayenne peppers, for the health benefits. And as for the question about the solids – YES YES YES, use them, we put them in a tupperware container and then add it to soups and stir fry! It’s awesome stuff! This is really interesting and I’m going to try it. What is also interesting is that the same ingredients (minus the ACV) were given to me to make a natural antibiotic. That recipe was 1 clove garlic, amounts roughly equal to the garlic clove of onion, ginger, horseradish and jalapeno pepper. Place them in a blender with 1 tablespoon of purified water, liquefy and chug it down. Fortunately I haven’t had a need to try it, but I’ve always remembered the recipe. I’m wondering if your tonic recipe could be used the same way? Maybe dilute a tablespoon in a large glass of water to get it down. Since Super Tonic is medicinal, I sometimes make a hot tea of a couple of spoonfuls of it and a big dollop of Manuka honey (which is also medicinal) when I feel a cold coming on. This didn’t give the amount in pounds for the balance of the ingredients beyond the onions. Can you clarify? The amount of ingredients used depends on how big of a batch you want to make, which is determined by several factors such as how much of each ingredient you can get at one time, how big your food processor is, and how many jars you have to work with. Because we had a huge mixing bowl and two cases of jars on hand, and because we wanted to make enough to last both our households for at least a year, we went big. We didn’t weigh or measure our ingredients, just “eyeballed” the different piles to see that they were roughly equal amounts, then got enough vinegar to fill the jars we had. I only know the weight of the onions because we bought all those at one time; the other ingredients came from a couple of different places at different times. Opinions on this may differ, but my feeling is that each batch you make is unique depending on type and amount of ingredients used (for example, habanero peppers or cayenne peppers) and that it’s all good. I also don’t think that using a little more or less of one thing will hurt the final result. Can you drink the final product or is it just a cooking additive? It is both, but you will probably want to dilute it quite a bit to drink it because it is very strong (if you can drink it straight, you’re tougher than me!). I used some today to make dressing for coleslaw, which was excellent. Awesome thanks im definitely going to put this recipe to good use!! I have been making this for about 1 year and I love it. I do a batch a month. I was taught another wa,y but will add the onion in my next batch. My recipe is 1 cup fresh garlic, 1 cup fresh ginger, 1 cup ACV, (Apple Cider Vinegar, 1/2 cup fresh lemon juice, 5-6 fresh cayenne pepper. Mix well in blender. Stir in 1 cup honey. All organic of course. I add other things depending on how much time I have like fresh nutmeg, fresh cinnamon, black seeds, and some flax seed. I also add some unsulfered molasses for B vitamins. The molasses takes the bite out. 🙂 I take 1-2 tablespoons in the morning before breakfast. It’s a eye-opener for sure! I wasn’t told that I had to ferment it but I think that is great too. I heard it should be made at certain phases of the moon. Do you know about that? I can not find any horseradish. Can i use something else? How can i make it if I couldn’t find any horseradish? You can leave the horseradish out, of course. This is just a recipe, not a decree. Make it with what you have. Thank you so much for sharing the “recipe”! We love the super tonic and after my friend supplied us with it, we started making our own for the first time. I made a huge batch of 10 quart jars just 2 days ago. Today, when I inverted them, I found in one of the jars a green blue garlic (which didn’t get chopped up all the way) and each other glass has a very very slight (!) green blue tint to it. I removed the large bright blue-green garlic but in the other jars I can’t because it’s mixed in. Will they still have the health benefits or did I just turn all the ingredients into poison :(? I have never personally encountered this color change. 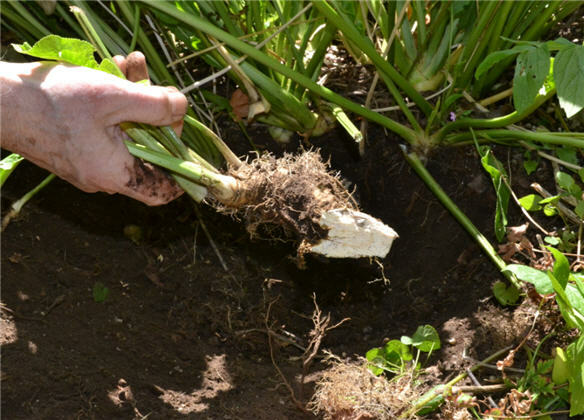 It appears that the garlic is still safe to eat unless there are other signs of spoilage. My dad bought the recipe from Schulze many years ago, but its reprinted free online everywhere now. We dont use 3 lbs of each we just use a big handful, then 1 or 2 qts of venegar is enough to fill a gallon jar. It only needs to steep from the new moon to the full (about 2 weeks) to be effective, then strain off and it never goes bad. Never thought about letting it steep in small jars—that wouldve been handy the time i covered the gallon with plastic wrap and returned to find it eaten away! The Schulze recipe is online? I can’t seem to dig it up, do you have a link? This is that recipe, Mike. There’s nothing magical about it. Hello! I am just seeing your recipe. I found it because I bought the Super Tonic and I think it is delicious and would make a great salad dressing, bloody mary, additive to soup, etc. Going to try this. I’m also going to try a small portion to see what it would be like as a salad dressing. Thank you so much.